Wow..never thought of making halwa with potatoes,sounds great and yum..
we used to get this in our office canteen sometimes..i love it..
Wow this is new to me and looks fabulous! I'll a pinch of saffron too...hmm divine! 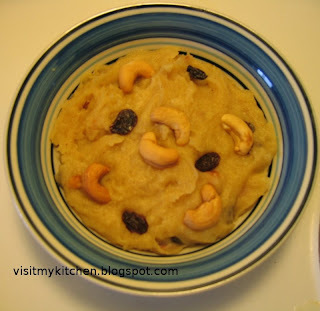 I prepared potato halwa long back, looks fabulous! this halwa sounds awesome...looks really tempting! you have a nice blog! this is from my friend Priya...She says, adding garlic gives a lot of flavour to the dish and the traditional recipe involves the use of garlic. incredible...coudln't think of a sweet dish from potatoes, seems easy and looks tasty too. Nice idea.. looks very delicious.. lovely click ! !